If life throws you lemons, ask for the tequila and salt. Wise words shared by a guest on our wedding day. And let’s face it….none of us are going to go through life without avoiding tough times. I feel this very strongly at the moment, through my younger cousin who’s in her 20s. I imagine she would rather be in Mexico drinking tequila right now. Instead, she is awaiting a second round of chemotherapy having discovered she had cervical cancer 6 months ago. There are 15 years between us and we grew up in separate parts of the Midlands, so apart from major family events, we’ve not ever really had a relationship. I can remember when she was born and her christening (how old do I feel!) but she has blossomed into the most stunning girl. Beautiful. A heart so full of love and a smile that is so pure, which her mother and grandmother would be proud of. When events like this occur, or you are touched by such an event, it can’t help but change the course of your life and how you approach day to day living. In adversity, whether big or small, sometimes it’s hard to see what gifts the situation brings. But sometimes a new view on the world can bring about new opportunities, ones that may not have been contemplated or seen before. Friends who suddenly lost a close friend at Christmas are now moving to Australia next week after a job arose and made them seize a relocation opportunity, which may have passed them by otherwise. Day to day something as small as a forgotten purse at the supermarket meaning an unscheduled journey home resulting in listening to a song on the radio that wouldn’t have been heard may bring some insight or much needed joy. We are presented daily with these gifts and it is up to us whether we see it or how we respond. I am thankful that my cousin and I have met at one of life’s junctions as our lives have shifted for different reasons, at a similar time. I feel grateful to walk the journey alongside her, and for her allowing me to share in this part of her life. I am sure for us both it will abundant in gifts and insights to remember that life is to be lived. Big or small if we live in the present, life really is a gift. 1. Prepare 2 x 15cm square piece of tin foil and 2 x 15cm square of parchment paper. 2. Place the foil square on top of the parchment square. Place 4 tomatoes on the top half of the square, place the herbs on top and then the piece of hake. 3. Season both sides of the hake with salt and pepper. 4. Fold the side of the parchment/foil up to meet the other side to make a rectangle shape. Then starting at one of the width sides, start folding the paper over itself at one inch intervals, as though you were crimping a Cornish pasty to make a tight seal. Go all the way around till you get to the other side, and then bang it with a rolling pin, to ensure the seal. 5. Place on a baking sheet and bake for 15 minutes. To prepare the potatoes, place 1 potato on a wooden spoon (like an egg and spoon race!) and cut through the potato at 2-3cm interval as much as the spoon will allow so that it makes a concertina. This will cut through the majority of the potato, but leave a hinge of uncut potato. Place all the potatoes in a bowl and drizzle over a slug of olive oil, and mix with your hands so that each potato is covered in oil. On a baking sheet, place the potatoes, concertina side down. Sprinkle with sea salt. Bake for 20 minutes, turn over, sprinkle with salt and then bake for another 20 minutes on the other side. I served this with some wilted chard as it is British and in season at the moment. I pulled the chard off the stem and finely diced the stem and fried it in butter. I then added the chopped leaves to the pan, seasoned, stirred and added a tablespoon of water to steam the leaves. Cook for 5 minutes. It cooks more like spinach than thicker greens like kale and cavolo nero. Equally, it would be lovely with some steamed green beans too. Place the greens on the plate and place the tomatoes and hake on top. 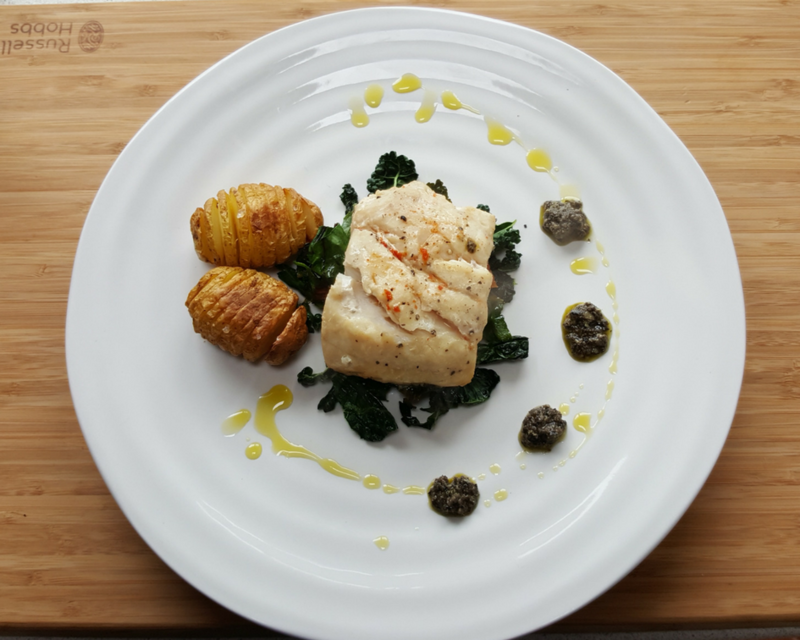 Spoon over some of the cooking juices over the hake and dot some tapenade around the plate. I had wanted to buy some tapenade, but couldn’t get any locally, so it’s definitely a larger supermarket or deli item; In the end, I had to make my own, which was simple, and tasted delicious! So if you fancy giving that a go too, just try this recipe below. Chuck it in the blender and off you go! Put the olives, capers, garlic, anchovy fillet in a blender and pulse 3 or 4 times. With the blender turned on, pour in the oil slowly through the lid. Season with pepper and salt and keep in a sterilised jam jar with some oil over the top. Check out my Fuss Free Foodie tutorial for tapenade HERE! 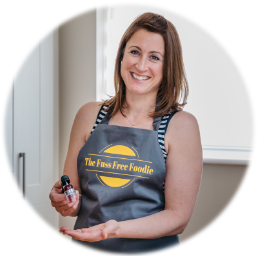 Don’t forget to subscribe to The Fuss Free Foodie You Tube channel to catch all the tutorials! !